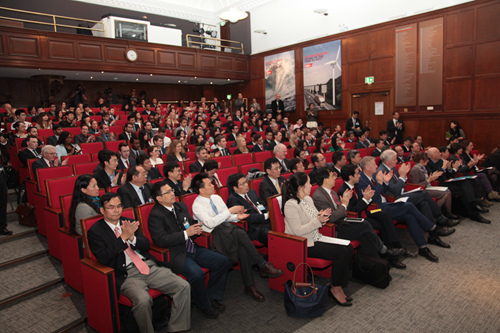 It is a real pleasure to attend this Forum on Forty Years of China-UK Student Exchange. This is my second event on student exchange in one week. The first was held at the Old Royal Naval College in Greenwich. That was for the opening of an exhibition about Yan Fu. It was both a commemoration and a reflection on history. One hundred and forty years ago in 1870s, when China was weak and being dismembered, Yan Fu came to Britain with the first group of Chinese students. These young students came with a dream of national salvation and revitalisation. The impact of their studies in UK was historic. Yan Fu and his fellow student returned to China a few years later to spread the advanced modern western ideas and technology in China. They had a profound influence on the modern history of China. Yan Fu and his colleagues were the earliest student exchange between China and the UK. Today’s commemoration is against a completely different historical backdrop. We are gathered to commemorate China-UK student exchange after the founding of the People’s Republic of China, especially after the establishment of diplomatic relations at the ambassadorial level between China and the UK in 1970’s. Bilateral educational cooperation since then has evolved on an unprecedented scale. For the past four decades hundreds of thousands of Chinese students and scholars have studied in the UK. In turn, many young British students have gone to China. These forty years of flourishing and fruitful China-UK student exchange is both hugely rewarding and inspirational for both nations. There have been many mutual benefits. First of all, Sino-UK student exchange is built on a foundation of positive relations between our two countries. This sustains the student exchanges and drives its momentum. · We have resolved the issue left over from history. Hong Kong has returned and become a special administrative region of China. · China and the UK have established comprehensive strategic partnership, and set up a number of high level dialogue mechanisms. These include the Prime Ministers’ Annual Meeting, the Economic and Financial Dialogue, the Strategic Dialogue and the High-level People-to-people Dialogue. · Two-way trade has grown from 300 million US dollars in 1972 to over 70 billion in 2013. · Forty years ago, the first group of students sent by New China numbered only 16 and there were only 11 British students in China. 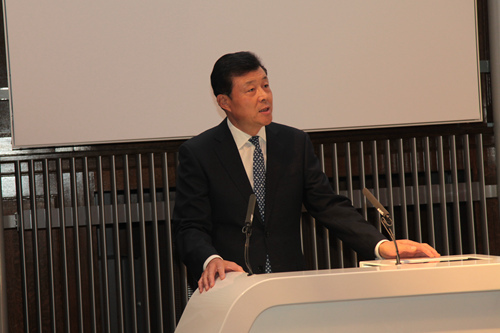 · Today, there are over 130,000 Chinese students in the UK. They are either government or privately funded. · Britain ranks second in the world and first in Europe in receiving Chinese students. 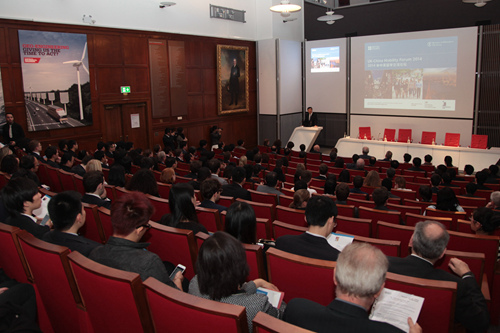 · Chinese students have become the largest overseas student community in the UK. · Meanwhile, almost five and a half thousand British students are now studying in China. This is on the same scale as the number of Chinese students in the UK - given the different size of the population of our two countries. · In total, the number of students exchanged over the past four decade amounts to 450,000 Chinese and 35,000 British. As a result of the development of overall China-UK relations, the student exchange has turned from a small stream to a rushing river. Let me turn to the second mutual benefit from China-UK student exchange. The vast number of Chinese students who have studied in the UK have become the backbone in China’s social and economic development. · 27 are now fellows of Chinese Academy of Sciences or Chinese Academy of Engineering. · 130 are members in the One Hundred Talent Programme of Chinese Academy of Sciences. · 55 are fellows of the Changjiang Scholars Programme of the Ministry of Education. · In addition, among the principals and leading officials of the 39 universities in the government 985 project, 13 had studied in the UK. These statistics show that studying in the UK prepares young Chinese students with knowledge and life experience that is vital for career advance. These figures also show that back at home, China offers a broad platform for their career development. The returning scholars can certainly expect to realise their personal dreams back at home and at the same time profoundly influence the realization of the ‘Chinese Dream’. This leads me to the third gain from student exchange. For our two nations the student exchange greatly advances our people-to-people interaction and builds a great bridge and bond between the people of China and Britain. Both China and the UK have a long history and rich cultures. Exchanges on the basis of mutual respect for each other delivers huge benefits for our peoples. In this spirit of sharing and understanding, we are able to learn from each other, develop hand in hand and build our future together. For forty years, Chinese students have been pioneers in China’s opening up endeavour. They have learned advanced science and technology and management expertise from Britain. They have also brought Chinese culture to British people and helped build mutual understanding and friendship between our two peoples. · They are pioneers in economic cooperation. · They have pushed forward collaboration in education. · They have involved in deep exchange in science and technology. · And they have always been strong promoters of China-UK relations. It is without question that the exponential increase in student exchange has delivered enormous progress in China-UK relations. Forty years on, there is no doubt about the immense value of China-UK student exchange. Today, we can join together to applaud the unprecedented growth and great achievement of student exchange, and its contribution to China-UK relationship. Looking forward, the Chinese Government will continue to send more students overseas, encourage and finance more foreign students to study in China. We will continue to promote youth exchange and mutual learning with foreign countries. It is my very sincere hope that the UK will continue to be a primary partner with China for student exchange. I am confident that with joint efforts, we will harvest even richer fruit and write a more splendid chapter for China-UK student exchange in the next forty years. In conclusion, I wish this Forum a complete success.